The folks who brought the world's first inductive charger for the Magic Mouse called the Magic Charger, have finally announced a similar inductive charger for Apple's Wireless Keyboard (2xAA battery model only) and Magic Trackpad called The Magic Bar, and it's a world's first too. 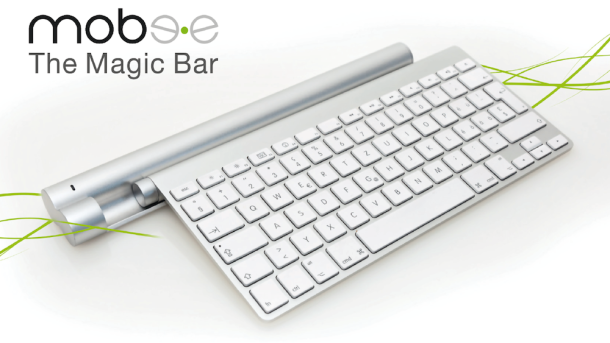 Mobee's The Magic Bar works by replacing your batteries inside your Wireless Keyboard and Magic Trackpad with the rechargeable cylinder battery pack and away you go. You can wirelessly recharge your keyboard and trackpad by simply sliding into the docking bay that is made out of aluminum to perfectly match with your Apple input device. Shipping will only start at the end of June with a price tag of $60, and €60 for European consumers.